If you continue to browse and use this website, you are agreeing to comply with and be bound by the following terms and conditions of use. If you disagree with any part of these terms and conditions, please do not use our website. 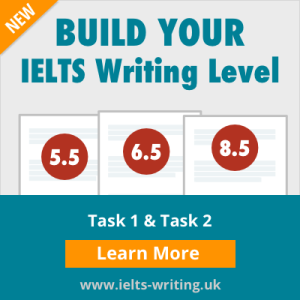 The terms ‘IELTS-PRACTICE-TESTS.com’, ‘us’ and ‘we’ refer to the owners of the IELTS-PRACTICE-TESTS.com website. The term ‘you’ refers to the user or viewer of our website. Unless otherwise expressly stated, copyright or similar rights in all material presented on this website, apart from those held on any ‘links’ page and used as hyperlinks to other websites, are owned by Exam English Ltd.
You are entitled to download and print the practice tests for your own individual study use only and you are not permitted to share free or commercially, or distribute free or commercially any of the contents in any form. Copies of the website pages which you have saved to disk or to any other storage system or medium may be used for subsequent viewing purposes or to print for your own individual study use only. You may not (whether directly or indirectly including through the use of any program) create a database in an electronic or other form by downloading and storing all or any part of the pages from this website without prior written consent save as expressly authorised by an agreement in writing between us. Unless with our prior permission no part of this website may be reproduced or transmitted to or stored in any other website, nor may any of its pages or part thereof be disseminated in any electronic or non electronic form, nor included in any public or private electronic retrieval system or service. You agree that all the materials displayed on or available through this website including without limitation any and all names, logos, data, information, graphics, underlying software, displayed on or available from this website are protected by copyright, trade mark and other intellectual property laws and are available for your own individual study use only. You must not copy, modify, alter, publish, broadcast, distribute, sell, transfer or share any of these materials without our express written permission. You agree to use this website and its content, and the services and products delivered herein only for lawful purposes. Your use of this website including all content downloaded or accessed from or through this website is at your own risk. Every effort is made to keep the website up and running smoothly. However, we take no responsibility for, and will not be liable for, the website being temporarily unavailable due to technical issues beyond our control. In no event will we be liable for any loss or damage including without limitation, indirect or consequential loss or damage, or any loss or damage whatsoever arising from loss of data or profits arising out of, or in connection with, the use of this website. Whilst precautions are taken to detect computer viruses and ensure security, we cannot guarantee that the website is virus-free and secure. We shall not be liable for any loss or damage which may occur as a result of any virus or breach of security. We give no warranties of any kind concerning the web site or the content. In particular, we do not warrant that the website or any of its contents is virus free. You must take your own precautions in this respect as we accept no responsibility for any infection by virus or other contamination or by anything which has destructive properties. Through this website you may be able to link to other websites which are not under our control. We have no control over the nature, content and availability of those sites. The inclusion of any links does not necessarily imply a recommendation or endorse the views expressed within them. You agree to indemnify and hold Exam English Ltd. and its subsidiaries, affiliates, shareholders, officers, directors, agents, licensors, suppliers, employees and representatives harmless from any claim or demand made by any third party due to or arising out of the use or connection to this website (including any use by you on behalf of your employer or your violation of any rights of another). We offer a refund if you have not downloaded the practice tests and you contact us within 30 days. We offer a partial refund if you have partially downloaded the practice tests, and you contact us within 30 days. You have 90 days to download the practice tests. Each test can be downloaded a maximum of 8 times. In compiling the content contained on, and accessed through this website, we have used our best endeavours to ensure that the information is correct and current at the time of publication but we take no responsibility for any error, omission or defect therein. All study materials are generally hypothetical or imaginary and are included for educational purposes only. Any resemblance to individuals, companies, institutions or otherwise in real life is entirely coincidental. The opinions expressed in any third party materials are not necessarily those of Exam English Ltd. but are provided for academic practice and educational purposes only.